So, I'm thinking of retiring Friday Finds. Actually, seeing as it is Friday and this is not a cookbook recipe it seems that I have already thought about it. Posting cookbook recipes has been a great way to force me to use all those cookbooks in my kitchen, but posting the recipes here felt like a bit of a cop out-- especially when I feel like my head (and the backend of this blog) is so chock full of ideas for original content and recipes. So, with that in mind Friday Finds will be taking a backseat for a while (but, not necessarily completely/forever) in favor of more posts featuring original recipes, my new recipe re-dos, Chicago restaurant reviews, local foodie events, travel tips, and more... sounds like a good trade, right? Today I am taking you back to one of the first recipes I ever posted on A Squared in December 2011: a delicious creamy orzo. This recipe is always on dinner rotation in this house because it's easy, makes enough to last for days, and is a super versatile side dish. 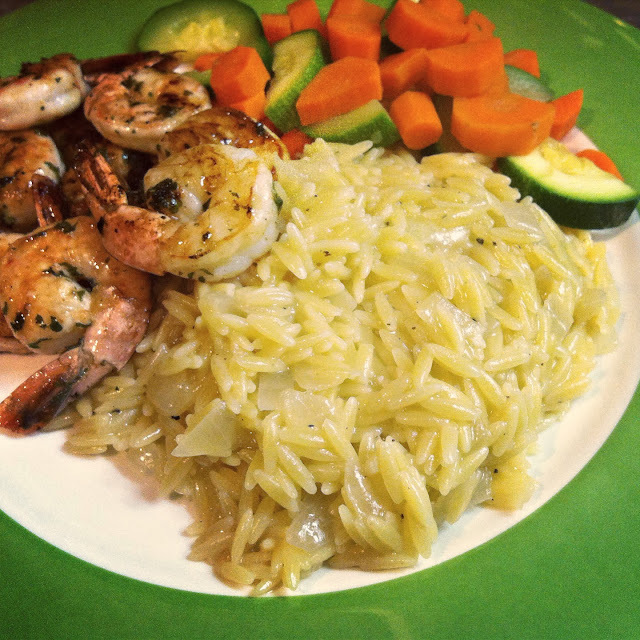 In my previous post I served it as a side dish for roasted chicken and tonight I served it with some simple lemon-marinated grilled shrimp, another favorite recipe that I will share with you later. This recipe re-do stays pretty true to the original, with one exception: this time around I wanted the orzo to have that great rich flavor that you get in an actual risotto from the addition of white wine-- hence the new name: "orzotto." You can certainly continue to make this recipe sans white wine (just use 4 cups of chicken broth instead), but the white wine really adds some amazing depth of flavor. Heat oil in large saute pan over medium heat. Cook onion for 2 minutes, stirring frequently to prevent too much browning. Stir in garlic and cook for 30 seconds. Add dry orzo to the pan and toss to coat, cooking for 1 more minute. Reduce heat to medium. Pour in wine and stir until the liquid has been absorbed into the orzo. After that, slowly stir in 1/2 cup of stock at a time. Adding the next 1/2 cup when the previous one has been absorbed, stirring constantly. When orzo is tender stir in a drizzle of olive oil and season with salt and pepper, to taste. Serve with grated Parmesan. Mmmm! I'm a big fan of orzo but don't make it nearly as often. I'm going to try making it with white wine next time- good idea! Orzo is one of my favorites-- especially this preparation! And it is delicious with our without wine. Enjoy!